Every day our support team answer a number of calls from people who have questions about e-learning and food hygiene courses in particular. Below are some of the most common questions we receive. Is it safe to do a Food Hygiene Course Online? Yes, as long as it is from a trusted source. Our Food Hygiene Certificate Level 2 and Level 3 courses are accredited by City & Guilds, and cover all of the information you need to meet your legal training requirements. Over 85,000 people have completed our online food courses, with over 1.3M learners completing a range of courses over 19 years of trading, so you can be sure you’re in safe hands. Virtual College is the parent company of the Food Hygiene Certificate website. We’ve had over 2M learners to date. We were established in 1995 and work with internationally recognised organisations in both the private and public sector. If you would like to know more about Virtual College and the 300+ courses currently on offer, visit our main website http://www.virtual-college.co.uk. LeveI 2 is the level of training required for food handlers to meet legal requirements. Most people who buy our Food Hygiene Training require Level 2 for Catering which covers people working in restaurants, kitchens, cafes, schools, colleges and most self-employed people, such as mobile takeaways and home bakers. You do not need to complete Level 1 before completing a level 2 training course. Level 2 for retail is aimed at people handling food in retail outlets e.g. supermarket staff and delivery drivers. Level 2 for manufacturing is aimed at people who work in factories and packing environments. The Level 1 course is aimed at providing a basic understanding to anyone who has a general interest in the subject or may be preparing to start a job in the catering industry. The Level 3 Supervising Food Safety course is designed for people who have completed Level 2 but may need additional training such as supervisors and business owners. It expands your training to include topics such as identifying problem areas and how to recommend solutions. If you’re still confused about which course is right for you, call 01943 605976 or email our e-Learning Support Team on as@virtual-college.co.uk. It is recommended that you refresh your Food Hygiene training every 3 years to ensure you are complying with legal requirements of working in a food environment, but there is technically no limitation on how long your certificate is valid. 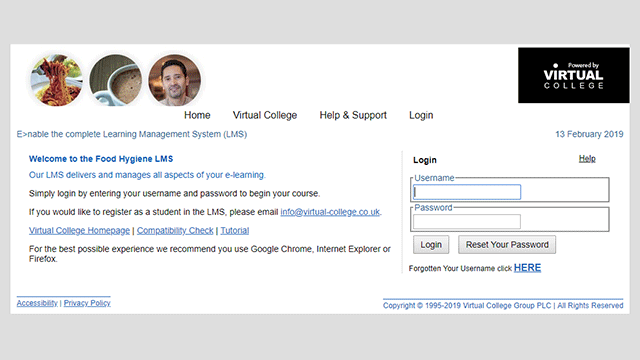 You can recover your login details at any time by using the Forgotten Login Details link - the system will automatically send a reminder to the email address that is on your learner record. This link is also available on the login page. Alternatively, you can always give our e-Learning Support Team a call on 01943 605976 as they will be able to reset your password for you. Do I have to do your course online? Yes, you can access your training at any time using any computer with internet access. Online training helps us to reduce the cost to you, while keeping a high consistent standard of training. We do have a team of support staff available to call or email between 8:30 am and 5:30 pm, Monday to Friday. By completing the course online you receive the same level of training as a face to face course, but without having to travel to a training centre. The course is designed to be as thorough as possible and many people prefer this method of training as they can proceed at their own pace, while the interactive nature helps them to take in more information. 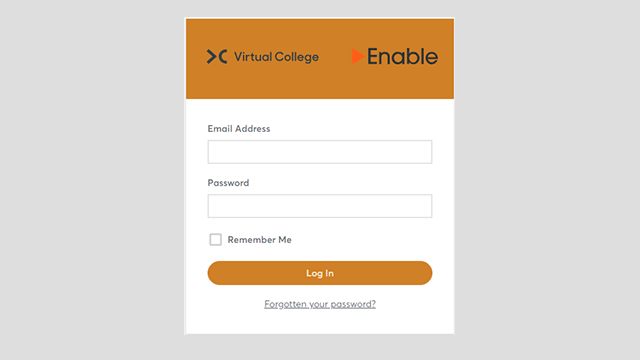 Logging on to Virtual College e-Learning is quick and simple. After the course has been purchased, you will be sent an email with your username and password. Go to www.vctms.co.uk and enter the details in the username and password boxes. After logging in you will see a list of the course(s) purchased and be able to start your training. If you have to stop for any reason, the training is designed to remember your progress, so the next time you log on you will be able to carry on where you left off.